Our goal at Horsevision Equine Assisted Training is to ensure you have an extraordinary experience where ever you live. Our worldwide training opportunities offer placements in countries outside of where Horsevision is located. 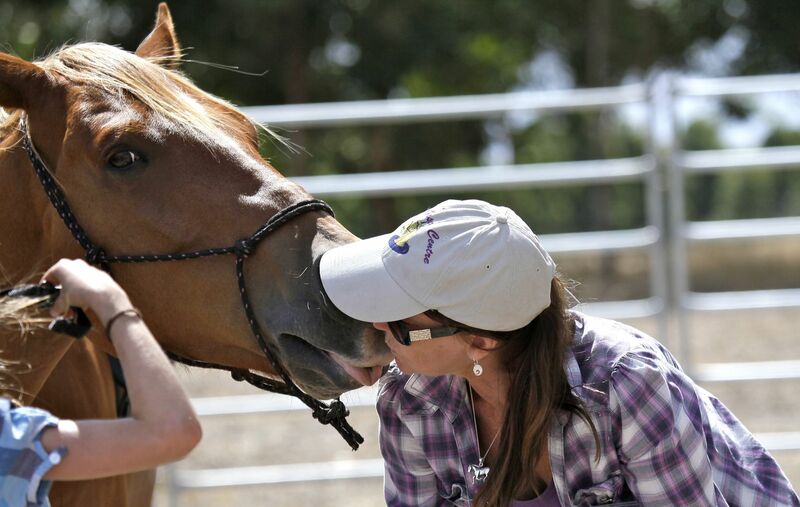 Christine Scott is a Pioneer in the field of Equine Assisted Learning and Therapy in Australia. She has facilitated programs, held training and consulted internationally in Australia, Sweden, Germany, New Zealand and the UK. Chris involves horses in programs developed to help people with their emotional and physical problems. This work strengthens bodies, improves communication and helps people confront their fears. Horses have the ability to learn human body language and then give participants feedback. The horses respond to our true emotional state. As a facilitator Christine helps communicate this feedback to participants. Chris is the founder of the Philosophy of Living Model of Equine Assisted Learning/Therapy which is inspired by the 3 Principles. These Principles help participants to have more peace of mind, more perspective, fear less and get to live a more inspired and creative life. Christine works with Youth, Corporate Groups, Business’s, schools, groups, individuals and families both in Australia and internationally. This workshop may include herd activities, horse-human activities, liberty, groundwork, games, contemplations, team building and mounted experiences for the purpose of building confidence and communication. No horse experience is necessary. Numbers for the program are limited to 12 so early booking will be essential to secure your place. To whom it may concern, I was involved with the Horse Vision Centre as part of a partnership with my current employer Lamp Inc. The program was incredibly beneficial not only for me but also for the young people involved. This program promoted confidence and resilience within myself and the participants and allowed the building of self esteem. Through our individual journeys we were able to discover what we were capable of and focus on what we could do rather than what we were unable to. We were given the opportunity to participate in activities as we felt comfortable to do so, thus allowing an increased self awareness without a pressured environment. The activities were fun, exciting and relaxing, and at the end of each session all were reluctant to leave. Through the recognition of their own skills and abilities the young people involved have now made positive choices in their lives having a new found confidence to do so. The lessons that were learnt through the activities are transferrable to all areas of our lives encouraging us to grow and prosper. The development of relationships between participants and with the horses was positive, beneficial and practical. The evaluation that was received at the conclusion of the program was all positive, with all participants stating that they would like to be involved again. I felt that this program was incredibly beneficial for the young people but also gave me an opportunity to learn a great deal about myself, my boundaries and confidence. I learnt how to have a clear mind and remain positive. The program had an overall healing effect allowing young people the opportunity to learn to love laugh and play again. The young people learned the benefits of being committed, reliable and consistent through the length of the course. I would not hesitate to be a part of this program again, and feel that the activities could have a positive effect on a range of people. Recently I was going to the Horse Vision program to get hours for my work experience and to pass the Certificate Two in General Education for Adults. The Horse Vision program helped me with communication. I am ok with it I just lose the words in my mouth and can’t find them. All the horses, but mainly Guinness helped me get better at communicating properly with other. The crew at Horse Vision are great; they helped me to overcome my fear of heights when being on a horse. I found it hard at the start to make a real connection with the horses but with all the exercises we did and with the team I made it eventually. I think that if you are unsure of going, give it some thought and just think of how you can benefit from it and you will find out. Communication is a big deal in my life and going to the horses fixed the thing I could not do myself. It also gave me ideas on how I can soon help myself in the future when it comes to communicating with people. We gave the horses help with activities that they could not do and in turn they helped us. Again if you are not sure that is fine, you just need to give it a try because you can’t judge it until you try it. And once you try it you will love it. Hi. I’m Steven I’m 17 and have been out at Horse Vision for over a year. I now feel more confident and more knowledgeable from working with the horses and Chris. I have learnt to be more calm and strong with the horses. I found I had a really good connection with one of the horses because on the first day she (the Horse) chose me. I’ve learnt a lot of new things with Chris and the horses. I have felt more confident and have made lots of new friends. You learn things about treating horses and caring about them which makes you feel really good to be giving back. You learn how to bond with a horse become its friend and check its feet if they’re sore or just dirty and need a clean. You will learn how to horse float, round yard, check if it’s sore by checking for warm spots along his body and you may learn how to ride. After doing the 6 week program, I loved it so much I asked to do my work experience at Horse Vision. I have also done the extension program and I am still out there doing work placement even though I have reached the hours I need to pass the unit. I feel really proud of what I have achieved.